Jim Clemens Collection Vol.31 - GW Steam Miscellany. Jim Clemens Collection No.31. This is mainly assembled from previously unseen film from the Jim Clemens Collection, the footage has been assembled in the order the film runs off the original cine reels and features wide coverage across much of the old GWR Empire. A veritable feast of all that ex-GW steam which includes the branch from Oxford to Witney and Fairford, the "Great Western" high speed special on 9th.May 1964 from Paddington to Plymouth and back, a shed visit to Exmouth Junction, Gloucester (Horton Road), Worcester and Stourbridge. We feature the route of the "Cathederals Express" from Hereford via Malvern, Worcester, Evesham, Honeybourne, Campden Bank, Kingham, Oxford, Didcot and Reading to Paddington. 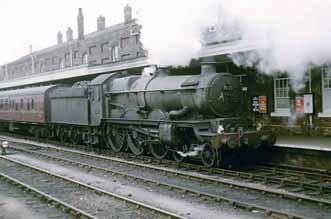 Cover photo:- Michael Clemens - Castle 4-6-0 No.7005 "Sir Edward Elgar" at Worcester in 1963.